I would like to present to you very useful web tool (PHP script) named Sypex Dumper. It’s extremely simple and convenient program that performs essentially a single function – management of dumps (backups) of MySQL databases. But doing it not just good but excellent. I had many occasions to use this tool and I remained very happy with it, because it has kept a lot of my time and nerves. Friendly Web 2.0 interface – it beautiful, simple and convenient. Through of using AJAX technology there is no page reloads while working with the program. Very fast speed of backup and restore of databases regardless of their size. Speed is really impressive. Sypex Dumper is much faster then other scripts and application, look at the comparison tables. For example, I have database occupying 47.3 MB. On my not such a fast hosting Sypex Dumper has exported it just in 19.48 seconds. 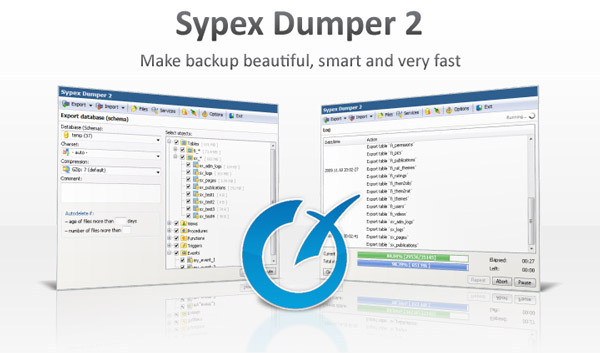 Support of huge databases – Sypex Dumper works excellent and fast with large databases, whether it is hundreds or thousands of megabytes of data. Now you can forget about phpMyAdmin, which creates the problems when importing/exporting large database. High degree of compression. For example, my database occupying 47.3 MB was compressed to 8.47 MB. Two file formats is available (Gzip and Bzip2), as well as varying degrees of compression for GZip. Support of service functions of MySQL: create/drop databases, check, optimize and repair tables, etc. Sypex Dumper is working correctly with character sets. A number of other functions. So, if you are webmaster and you are working with MySQL databases, Sypex Dumper is the tool that should be in your arsenal. Anything which is free is not a good option ;) . I was looking through the website and came to know its in BSD licence , so its cool . I am hearing about this for the first time , and I will try it out . Thanks for your great post and your site looks cool . Great work . I not agree. Why you think so? For eg : I have something in my hand wrapped with a good piece of paper . Will you accept it ? There is a possibility that it can be a bomb . The same thing for a software . If its a binary we cannot trust it completely . But just trust what the developer says. So I was pointing about the properitery, freeware , sharewares and open-source softwares . Hope you recognized . IMHO, in these cases it’s worth to pay attention on an opinions of a users, because they will not recommend a bad free software. Dimo I was not talking Sypex. It comes with BSD licence http://sypex.net/bsd_license.txt . There is not other ways other than trusting him :) . But if it comes with open-source , GPL , BSD licences any one can see the code and make it more wonderful . I gave this tool to my colleague, it works perfectly. Thanks for your post.